The improvement of the performance of code_aster is always a work in progress. It does in fact not deal only with the solving of quasi-static problems with millions of degrees of freedom. As such, the implementation of modal calculations involving hundreds or even thousands of eigen modes is part of these challenges. During the development of version 13 of code_aster, dynamic applications had already benefited from notable accelerations in their calculation: gain by a factor of two to 30, depending on the level of parallelism and the size of the model. 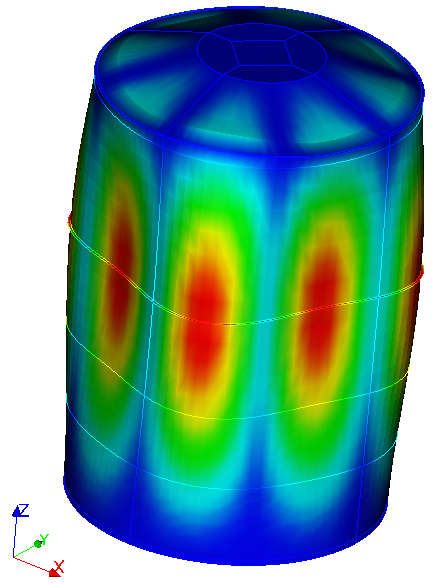 Fluid-structure interaction (FSI) simulations applied to the tanks of production units benefit greatly from the progress made up to now. Indeed, the analyses of these thin structures may require very extensive modal bases, namely up to several thousand modes. Such bases are necessary to ensure the convergence of the FSI calculation and, eventually, to ensure the quality of the simulation. Thus, the FSI study of the tank presented in Figure 1 requires the precise calculation of 6100 eigenmodes in the frequency band [0; 100] Hz. Even if the model has only 45000 degrees of freedom, their sequential calculation lasts more than six hours on the EDF cluster with code_aster 13.2. Nevertheless, this important cost should be put in perspective with the five days that would have required such a calculation up to version 12.0 (see Figure 2). In order to speed up this type of calculation, the frequency band should be cut into more reasonable sized sub-bands (ideally 100 modes per subband) and distributed on a group of cores. Each of the sub-calculations thus formed can also benefit from two other levels of parallelism: one at the heart of the linear solver, the other within linear algebra libraries. Thanks to the good parallel performances of the modal calibration operator INFO_MODE, it takes only a few minutes to construct such a cut. By cutting the initial band into 36 sub-bands, the 72-core tank calculation takes only 2.5 minutes in version 13.0 (two levels of parallelism) and even 1.5 minutes in version 13.3 (three levels of parallelism)! Future developments should focus on improving the performance of other calculations involved in FSI analysis. These are now predominant in calculation time, for example, the calculation of the added masses of the fluid carried out within the MACR_MATR_AJOU macro-command.